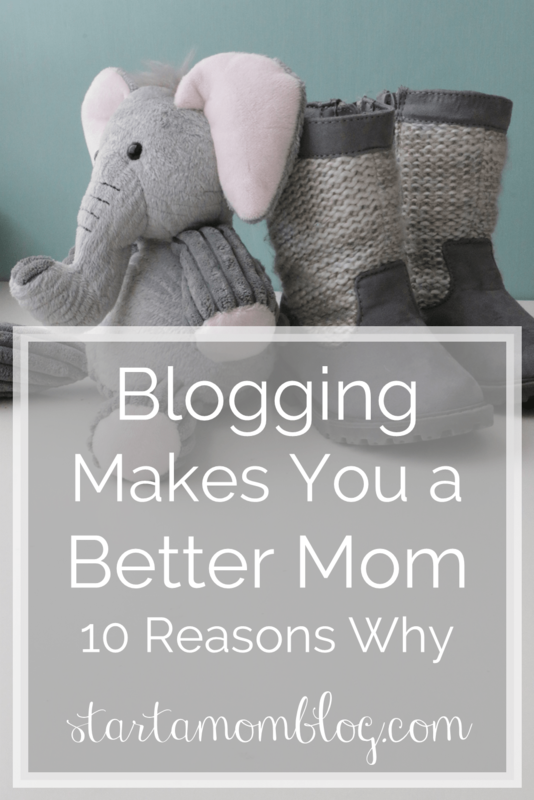 How does blogging make you a better mom? Isn’t being in front of your computer all day a terrible thing for family life? Not if you prioritize it correctly! Find out how blogging can be a huge benefit to you as a mom! Blogging forces you to reflect on your day to day activities. As you share your life with others online, you become more conscious about the type of parent you are, and the type you want to be. Reflecting on the achievements of your little ones and the struggles you have as a mother enables you to improve each day. After you reflect and realize you’re not perfect as a mom, you dive into other mommy blogs and discover their struggles and triumphs! You find tips that work for them and apply it to your life. The internet is a wealth of mom advice just waiting for you to type in “best mom advice” and hit search! Need to know about breastfeeding, potty training, meals under $5 or homeschooling? It’s all there! The beauty of blogging is that it is completely flexible! It will make you manage your time better and plan your daily activities in the most efficient way possible so that you can use the early morning or late night hours to write content for your niche. It will also help build up your self-esteem as you share with others and become a stronger blogger. Discipline and self-motivation are additional bonuses to a blogging lifestyle! Blogging is one of the most flexible work from home jobs. You can schedule your social media and blog posts to fire off automatically so that you can spend those precious hours during the day with your little ones. Blogging can be done early in the morning or late at night. You can even research articles and connect via social media in the park! Blogging is a flexible activity that can mold into your daily life. Blogging makes you a more empathetic mother. As you dive deeper into the blogging world you meet other mom bloggers who come from different backgrounds. You’re surrounded by a diverse group of women, from stay at home moms, working moms, moms with two children to moms with twelve children, homeschooling moms, crafty moms, fitness moms and foodie moms. You see the world from their eyes and your perspective changes. Blogging allows you to be present with your children while fostering independent play. Spend quality time one on one with your children and then retreat to the background as they continue to play. You can watch over them and also write a quick post for your readers. The flexibility of blogging fits well into the hectic schedule of a mom. Blogging is especially beneficial for stay at home moms! You connect with other like minded mothers and motivate each other on your motherhood journey. You can have adult conversations with people around the world and not just listen to the cute babbling of your toddler. It bridges the gap between being a corporate and stay at home mom without the commute – and wearing pajamas is acceptable! Stay at home moms need something for themselves other than daily household chores and diaper changes. Blogging gives you a goal of not just doing the laundry, cooking dinner and running after the kids, but it enables you to do something ‘grown up’. It fosters learning new skills, researching tips and tricks and working towards the goal of making money from home. Blogging is a cheap hobby that can save you hundreds per month! Once those first comments and likes start rolling in, you’ll be more eager to blog than to shop for the latest fashions. Spending time reading how other moms live frugally and how to adapt the minimalist lifestyle can do wonders for your wallet! The best part, this cheap hobby has huge upside potential. There are stay at home moms that make thousands per month blogging about arts and crafts, recipes, or parenting advice. You have a unique viewpoint as a mother, you have tips that have worked for you, why not share them to help out someone else and make money at the same time? Want to start a mom blog? Or do you already have a blog and need some time management tips specifically for mom bloggers? These are really interesting points you have made here. It is always a good idea to share what you are passionate about with other people. Blogging lets you do that. Keep up the great work and live unstoppable! I agree with every single point on this! I especially can relate the need to have something as a stay at home Mom that is for yourself and the value of the realtionships you build with others online. But, in the end the greatest result is that it does make you a better parent. I’d even go so far as to say a better person. Awesome post! Thank you so much for sharing! #8 is definitely my favorite! I go nutty being home all day without a project to focus my mind on. Working on my blog has been a great creative outlet for me and a great way to keep my mind busy. I’m a newbie mom blogger, but I really agree with #2 and #5! I have learned so much and been exposed to so many new ideas from other women online! Elanor, thank you for the comment. Just take it slow. Blogging is a journey and takes time. 🙂 Enjoy motherhood and blog when you can. Great post! You make several very true points. My blog is still in its infancy but as a sahm I’m loving doing it and seeing it grow. Sarah, fantastic! Isn’t it fun to see those pageviews come in? Especially numbers 7 and 8! I feel like I have a responsibility of a job again (in a good way) – without leaving my kids. And it is so nice to collaborate with other bloggers. I fulfill my need for a creative outlet and the need for adult interaction. 100% agree with you! 🙂 that’s why I love supporting mommy bloggers. I also find it motivates me as I write a lot of posts on crafts and recipes, so I have to actually DO them with my kids so I can take pics and write about it. That’s such a fun niche! And one I bet your kids love! Let me check out your link 🙂 thank you! 11. It teaches you self-compassion. When you admit to your own failings, readers rally to support you. And when you read other mom blogs, you know you’re not alone. These are all great points! I started my blog last February and didn’t start writing consistently until more recently. I had an “aha” moment recently when trying to rethink the premise of my blog and my blog’s mission statement. I took time to think about the why and the what. Now I’ve created more clarity and am excited to write posts for my readers. I’m finding that being home with my 14 month old daughter provides me with a lot of content. Blogging is very flexible! Blogging has given me an opportunity to interact with other bloggers, especially stay at home moms. I’ve enjoyed reading about their experiences and it has given me additional inspiration.